Virgin Atlantic has unveiled the all-new interiors of the A350-1000 fleet which it will bring in to service later this year, and the #avgeek community liked what it saw. Photos of a unique social area and bar, new Upper, Premium and Economy seating ‘with nods to designer goods and automotive luxe’, and an improved in-flight entertainment system, taken by those lucky enough to attend the event, flooded social media – and the ooh-ing and aah-ing has been almost universal. Customers will get the chance to enjoy what Virgin Atlantic claims will be the ‘youngest, cleanest and greenest fleet in the sky’ when the new A350s begin to ply the Heathrow – JFK route from August, followed by LA, Boston and Miami. A total of 12 of the aircraft are on order, replacing the B747s the airline currently operates – which will be phased out by 2021 – as part of a £3 billion fleet upgrade programme. Let’s face it, turning left is something to which every traveller aspires – and Virgin’s Upper Class cabin has always held a certain rockstar caché. Most of us will never get closer than glimpsing it through the curtains as we trudge towards the back of the plane, but those lucky enough to be heading to the pointy end can expect a big leap forward. The new seating, with 44 ‘Dream Suites’ arranged in a 1-2-1 formation, faces outwards and forwards so passengers are orientated towards the larger windows that are an important feature of the A350-1000. They also come with a ‘half door’ to provide a degree of privacy without completely losing the connection to the crew. Each suite features a sturdy, foldable table, storage space, personalised mood lighting, two USB sockets and an AC socket compatible with all plugs, and Bluetooth connectivity to the new entertainment system that’s accessed by an 18.5-inch screen. Also, regular Upper Class passengers (not, we’re not one either) will love the fact that the seat no longer has to be ‘flipped’ to turn in to the 20 by 82-inch flatbed, which comes with a nice deep mattress and what the airline claims is the ‘thickest pillow in the sky’. New, pre-orderable personalised pyjamas and an improved amenity kit complete an experience where every detail has had the Virgin touch. 2. Yes, but is there a still a bar? Virgin Atlantic pioneered the concept of the ‘bar-in-the-sky’, but is using the launch of its A350 fleet to rethink the model. Out go the awkward bar stools that had to be vacated every time the flight hit some turbulence, to be replaced with ‘The Loft’ seated social area, where up to eight passengers can enjoy food and drink in a convivial banquette-style area with its own 32-inch screen, Bluetooth connectivity and individual seat belts. Cool, right? 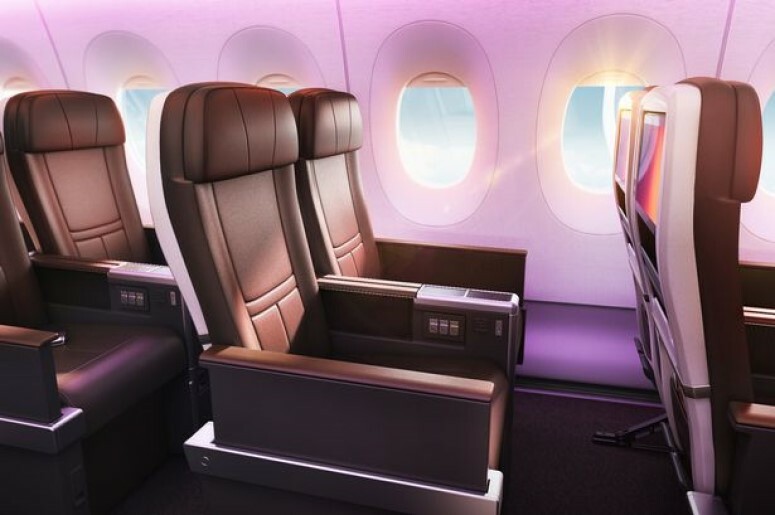 Where Upper Class is taking its inspiration from luxury hotels and exclusive resort experiences, it’s plain to see how Virgin Atlantic’s new Premium Economy cabin takes is looking to high-end cars for its cues. The new seats, of which there are 56 arranged in a 2-4-2 configuration, look and feel like the kind of thing you’d find in a sleek new Audi or Mercedes, with the tooled leather oozing quality and comfort. A 13.3-inch screen, USB ports, storage and an entertainment system you can control from your own phone complete the experience. Virgin Atlantic has made sure that the quality of its new in-flight experience is carried through the whole aircraft. Arranged in a 3-3-3 configuration, the 235 seats of the Economy cabin come with a generous 31-inch seat pitch (36 ‘extra legroom’ seats will have 34 inches of pitch), premium fabrics, a five-point headrest and an 11.6-inch screen. 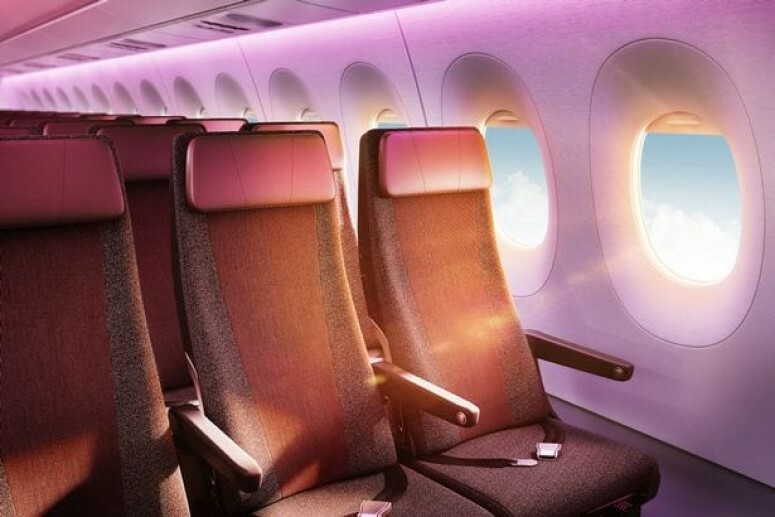 Reports from those at the event were that the new Economy seats were ‘very impressive’, and very much reflect the airline’s commitment to ensuring that ‘flying should be exciting’ for everyone. The new A350-1000s will also feature Virgin’s range of five new icons to reflect what the airline says is the ‘diversity of modern Britain’. Including a black man and woman, and a gay man, they’ll replace the ‘Varga Girl’ that has been a feature for the last 35 years on every Virgin Atlantic aircraft. 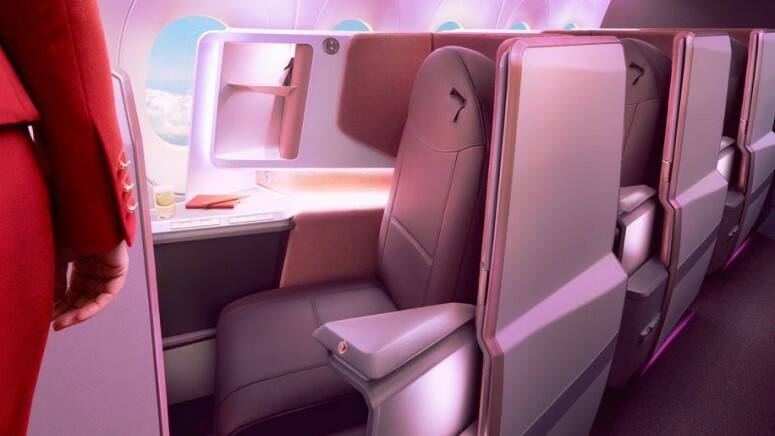 The transatlantic routes that make up the majority of Virgin Atlantic’s operation are ruthlessly competitive, and this reveal is the latest salvo in a product arms race which only two weeks ago saw British Airways share the details of its new Club Suite seating. It’s a game of one-upmanship that means only one thing to you and us – happier, better flying! Stay up to date with all the latest aviation news. We’ve got the lowdown on airline updates, new aircraft and more.